The tower, built in two phases, and south arcade remain from a C13 church. The rest was remodelled around 1330 and again in the mid-C15, the date of the nave roof. There are fine fittings and monuments. A market was established in Cuckfield in the mid-C13 and it quickly became prosperous; the large church on its southern edge reflects this. Though foundations of an earlier two-cell structure were found under the nave (4 p15) and a church is mentioned in a charter of c1090 (VCH 7 p156), nothing is now older than the three western bays of the south arcade, which are C13 as the simple abaci and double-chamfered heads show. The walls of the south aisle may also be C13, but there is no detail. The tower is certainly C13, though altered. It has two stages, the lower of rubble, with a double-chamfered west doorway, and the upper of ashlar, separated by a string-course. Both have plain lancets, so there is no great difference in date. 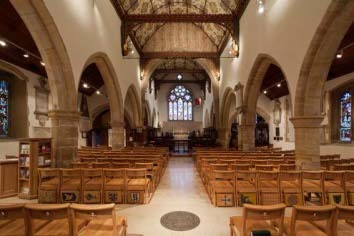 The presence of the tower determined that, unusually, the nave was extended in c1330 to the east, assuming its present rectangular plan, with chancel chapels as broad as the aisles. A further arch was added to the south arcade, so that its easternmost pier consists in effect of two responds back-to-back. Extending the nave in this way entailed the removal of the presumed C13 chancel arch, as the chancel was rebuilt further east, and there was a new north aisle with a four-bay arcade. Its hexagonal piers have more deeply moulded abaci and though the heads still have two chamfered orders, these are less differentiated than in the C13. The long square-headed windows of both aisles and chapels date from this time. Though they are renewed, the Sharpe Collection drawing (1802) shows similar ones. The present broad and high chancel arch resembles the C14 arcades, but the new tower arch is lower and closer to those from the aisles into the chancel chapels. These have the characteristic C14 device of polygonal responds for the inner orders only. The arcades from the chancel to the chapels are like the others. In 1924 quatrefoil-shaped openings were found above these arcades (2 p239), though they were not kept; similar ones, still to be seen, were found above the nave arcades. The tower may have been altered in other ways, for the heavy corbel-table below the battlements does not look C13 and the slender broach spire would also fit the C14. C15 alterations are more numerous than usual in Sussex. The nave and chancel roofs were replaced and the steeper pitch of the new roof is clear on the east gable. They are covered outside with Horsham slabs (which in their present form at least are said to date from the 1920s (Watney p39)) and are panelled inside with long wallposts with traceried spandrels. These roofs stand out in Sussex, despite C19 changes. Some wallposts obscure the clerestory openings,which were clearly blocked then and only re-opened in 1925 (Mitchell/Shell Guide p95) – the resulting lack of a proper clerestory makes the church dark. The panels of the nave roof have carved bosses at the corners, which still had their original colouring in 1866 (7 p184). Among them are the arms of Edward, Lord Bergavenny (VCH 7 p162), who has been suggested as the donor about 1460. Some windows were also changed, with panelled tracery in the east ones of the chapels and the west ones of the aisles. 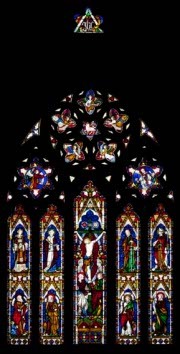 The Sharpe drawing shows a similar five-light east window, since replaced – its sill is under the present one. 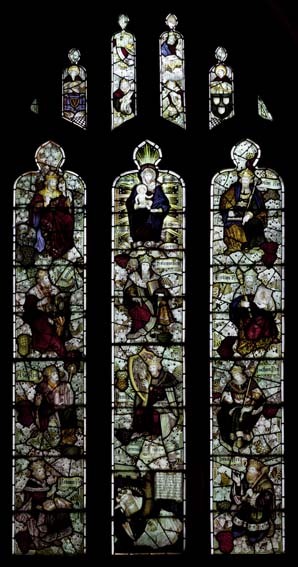 Some windows in the C13 part of the south aisle are also of this time; unlike the C14 ones they have segmental heads. The tower received diagonal buttresses, presumably intended to improve stability, which are not bonded in. A C16 square-headed north west window of three uncusped lights is probably linked with a bequest for ‘the New Yle’ of c1530 (SRS 42 p55); in view of the preponderance of C14 work, the window may in fact have been all that was done then. In about 1629 the Sergison family added a small chapel outside the north one (5 p2). Converted in 1888 into a vestry (Meads), the detail was replaced, except a depressed-headed doorway and segmental windows. The triangular inner buttresses may have been added to the tower in the C17 or C18, for they do not look mediaeval on Adelaide Tracy’s drawing (c1850) and have clearly been altered later. G F Bodley restored the chancel in 1855-56 (KD/S 1874), when much stonework was renewed, probably including a new east window of geometrical tracery, though he did not ‘tidy up’ any stylistic inconsistencies. Michael Hall suggests he was probably chosen thanks to the influence of a new curate, the Rev James Cooper, who was previously at St Paul, Brighton where Bodley worshipped. The tower was not done until 1871 by F W Holloway (BN 18 p404), who added a stair turret on the south side and no doubt remodelled the inner buttresses. 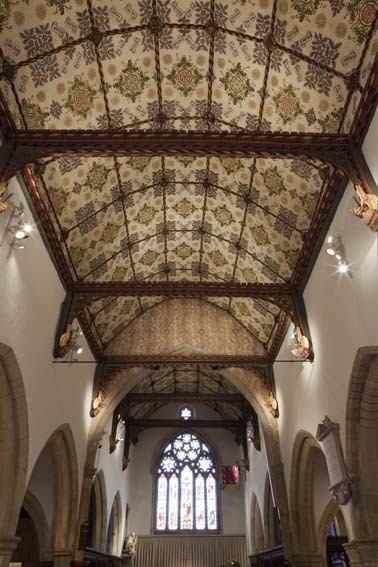 In 1866 C E Kempe, who had trained as an architect under Bodley and had been encouraged by him to take up painting, decorated the nave and chancel roofs (1 p243) and added angels to the wallposts, as he himself described (see 7). Kempe also decorated the chancel walls, but these were painted white in 1963 (V 36 (March 2011) p16). In 1883-84, he also added angels to the chancel roof, this time bearing shields, (CDK 1886 pt 2 p143) and designed a new south porch (BE p477); R H Carpenter had designed a north one in 1878, possibly re-using old timbers. 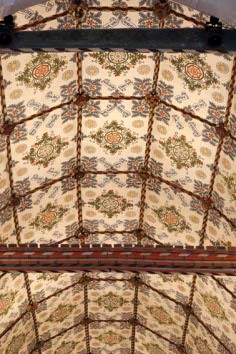 Kempe also embellished the aisle roofs with new bosses in 1891 (church website), following repairs in 1889. Various references to work in the mid-1920s, particularly to the roofs and upper parts of the church, have been noted already, but the responsible architect is not known. The next major work was in 1980, after the spire was destroyed by fire and replaced by one that is identical externally, but has a steel frame. In 2001 the nave roof was restored (CBg 76 (2002) p52) and the work was undertaken by Ruth McNeilage of McNeilage Conservation, working with H Harrison (8 ibid). The church was reordered in 2012 (8 p12), involving the removal of the pews by Bodley (see below) and also the moving of his screen (V ibid). 1. (South chapel floor) Henry Bowyer (d1588), an ironmaster and builder of Cuckfield Park. 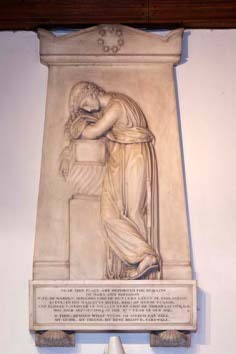 A single figure with a mid-C17 marble inscription to Bowyer’s grandson, Sir Thomas Hendley. 2. 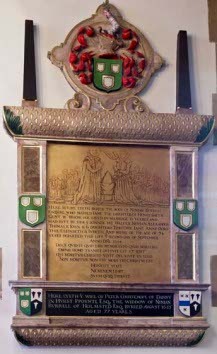 (South chapel wall) A single plate, showing the same Henry Bowyer kneeling, facing his wife across a desk with their children behind. This is believed to date from c1601. Both have been attributed to G Johnson of Southwark, since they show similarities to his work at West Firle, East Sussex (6 p67) but it is not known why Bower should have been commemorated twice. Chancel fittings and nave pews: (Formerly) Bodley, 1855-56 (V ibid). Font: C13 and much repaired, according to Watney in 1846 (p38). A bulbous bowl into the base of which are carved the capitals of four small shafts, surrounding the centre one. 1. 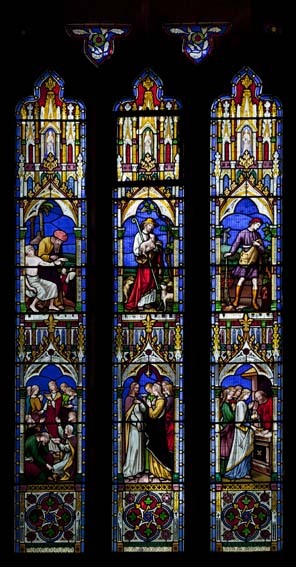 (East window) J Hardman and Co, 1852 (KD 1866). The dark intense colours are characteristic of the company’s work at this date and Bodley took a great interest in its design (Halls p82). 2. (North chapel, first north window) undated by J Hardman and Co (KD ibid). 3. (West and north windows of tower) C E Kempe. 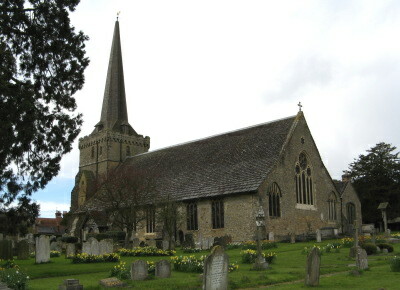 St Michael, 1875 and St Richard, 1901. 4. 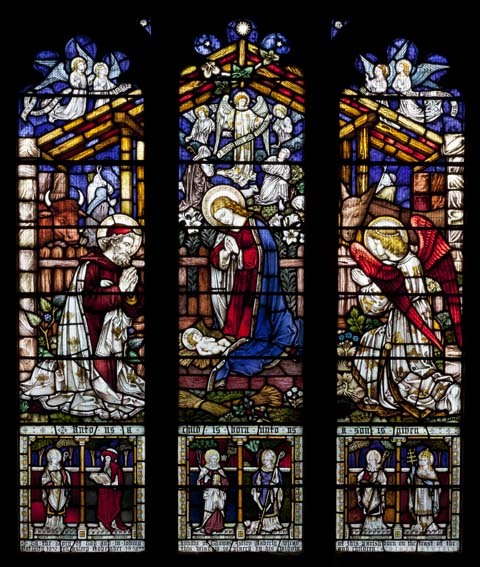 (North aisle, third north and west windows) Two windows by C E Kempe, 1887 and 1889. 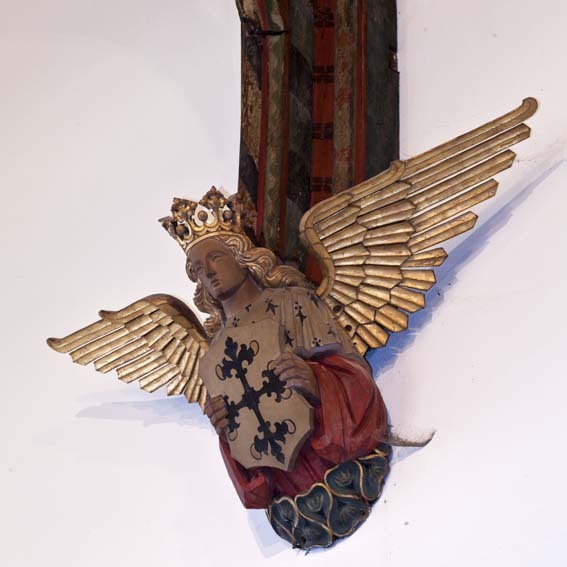 In the tracery of the former, an angel holds Kempe’s coat of arms. 5. (North aisle, first and second windows) Clayton and Bell, 1868 and 1854 (www.stainedglassrecords.org retrieved 11/2/2013). 6. (South porch) The quarries in the windows are by C E Kempe, 1887. 7. (South aisle, first and second windows) Clayton and Bell, 1879 and c1918 (ibid). 8. (South chapel, east and both south windows) Ward and Hughes, 1856 (KD 1855 p879). 1. (High up in south chapel) Ninian Burrell (d1628) He is shown at prayer behind a curtain held open by simpering angels. It has been attributed to the workshop of G Johnson (TMBS 13/5 p394). The painting is modern. 2. (North chapel) Guy Carleton (d1628) Formerly ascribed by Mrs Esdaile (3 p101, followed by BE p478) to Epiphanius Evesham, this is now attributed to E Marshall (A White (WS 61) p88). Shallow and naive carving with a central inscription in a heart, surrounded by smaller emblems and inscriptions in Latin and Greek. 3. 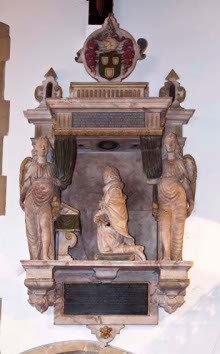 (South chapel) Sir Thomas Hendley (d1656/57) attributed to Joshua Marshall (A White (WS 61) p96) with three panels of inscription, flanked by corinthian columns. 4. (North of the altar) Charles Sergison (d1732, erected 1734), T Adye (Roscoe p9). A draped woman holds a mirror and a medallion depicting the deceased. 5. (South aisle) John Warden (d1730) and his wife Hopestill (d1749) by T Burnell (ibid p173). 6. 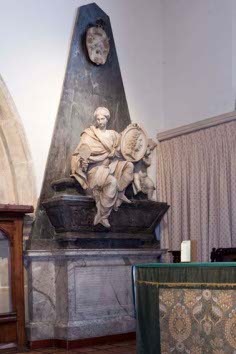 (Over south doorway) Sir William Burrell (d1797) antiquarian and historian of Sussex by J Flaxman (ibid p447), who also did the larger memorial to Burrell at West Grinstead, where there were further family estates. Flaxman is said to have chosen the position himself after a visit to the church (8 p13). 7. (Near the last) Percy Burrell (d1807, erected 1810), J Bacon junior (ibid p49). Burrell fell at the siege of Buenos Aires and is shown sinking into the arms of a soldier. 8. (Over north doorway) Mary Sergison (d1804), Sir R Westmacott (ibid p1359). She leans on an urn, a Grecian pose, frequently found among the sculptor’s work. 10. (In churchyard, near north porch) Sarah Tulet (d1840). A wooden rail memorial erected by the Sergisons of Cuckfield Place, for whom she worked for over 50 years. Piscina: (South chancel) Trefoil-headed and shafted, probably C14, not reset C13. 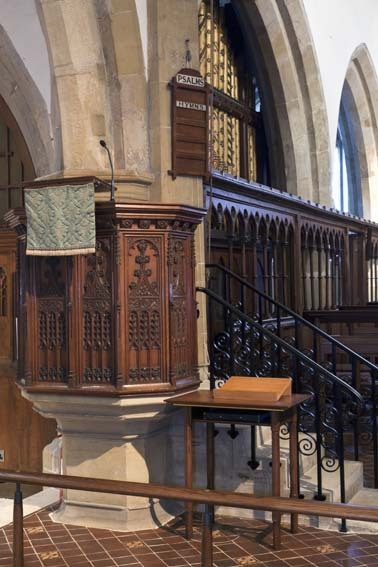 Pulpit: 1892 by C E Kempe (CDG 112 (1903) p43). Royal Arms: (Over tower arch) George III, after 1801. Painted. Screen: G F Bodley, 1880 (CDK 1882 pt 2 p159). In the most recent alterations, this has been moved to the tower (NW). Stoups: (By north and south doorways) Broken. 2. My thanks also to Josie Campbell for the photograph of the exterior.